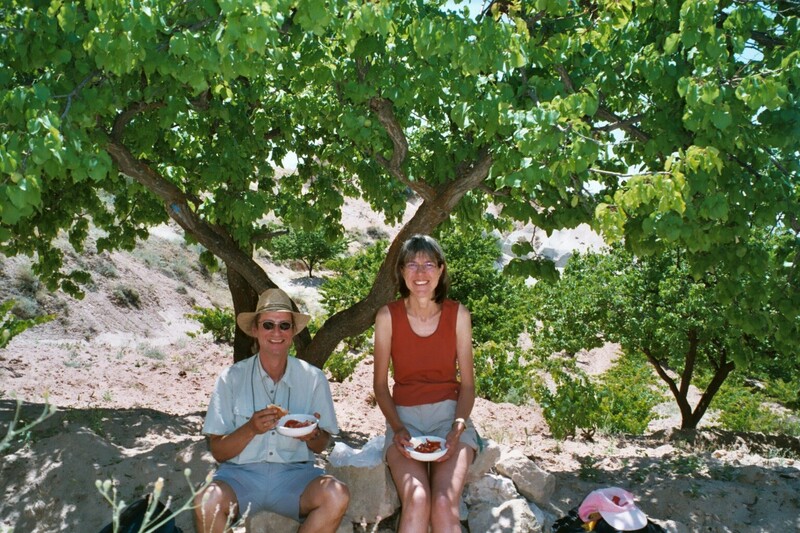 Where to eat in Cappadocia ? For little money also in Göreme the 'haute cuisine' is hard to find. This page is not about 'Guide Michelin' and his stars. 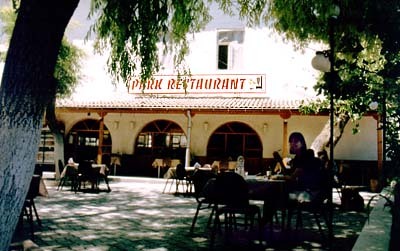 This is about places where you get a hearty welcome and tasteful food for reasonable money. And where, I am sure, you also will have a good time. white sheep cheese (beyaz peynir), salt, pepper and a piece of fresh bread. All this in a valley under a shady apricot tree. Okay, you won't get your beer here, as in all the other touristic restaurants. But you will see, this Salonu has something. 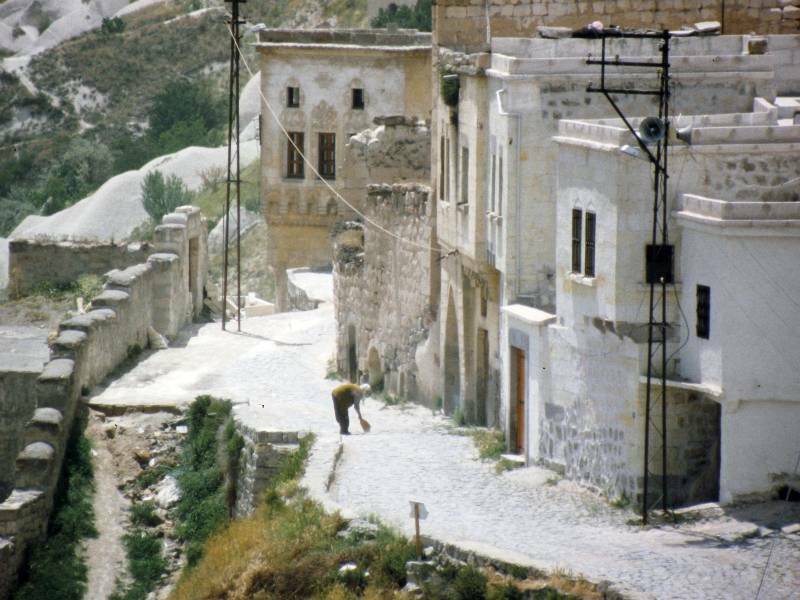 In Göreme this is more or less the only real turkish Lokanta. And If you look at the armloads of Pide the villagers take away, you can see that the locals vote for it. 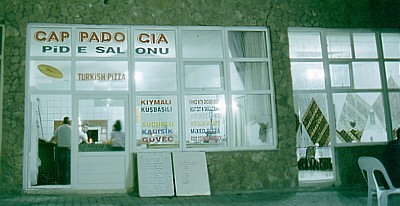 The Cappadocia Pide Salonu is located just behind the rows of teahouses in the villages center. Our evening special was a vegetarian Pide with Ayran. And you could do me a favor. Please would you be so kind, and tell those very friendly girls who serve there from time to time, that I made up this page. We speak just a few words turkish. 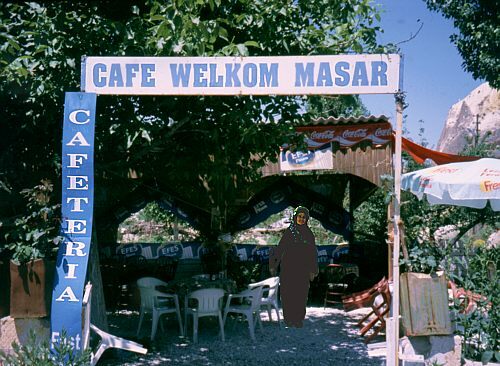 But when we arrived in the garden of "Cafe Wekom Masar", the woman who runs it let a waterfall of turkish on us down. We understood only "Gözleme", but the whole presentation sounded like "We have very good Gözleme, if you like your Gözleme with cheese or cheese and tomato, may be a bit pepper, or would you like your Gözleme with..... and we have everything to drink.... So what's your choice?" and two mixed gözleme (ve iki tane goezleme karashik) and a cold beer (ve bir tane bira soug). And it was prepared with love and served with a smile. We did not ask for the price in advance. And when to all the kindness after the meal the teas arrived unordered, we had a bit fear that the price will also be special. So don't forget the tip. You get to this garden, if you just walk from the cafe under the big walnut tree just beside the great ruins down back to the village center. Behind the first crossing comes the public WC, the police station and - the garden. And like above, please tell them that they are in the Internet. Thank You. 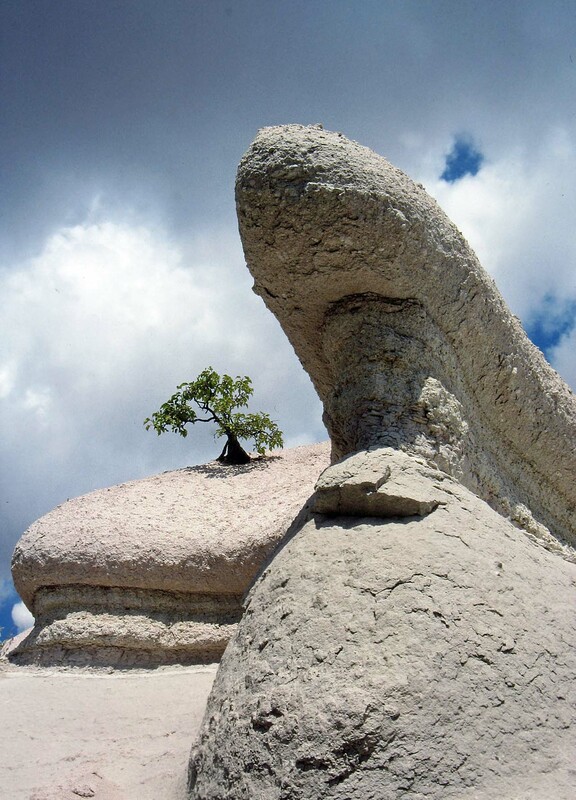 If this place would be in Göreme, it would be crowded. But this is Ortahisar and less touristic. The Food is good, but more important is the setting. Under large trees in the village center, beside the teahouse, in front of the mosque. We asked the proprietor what kind of herbs there are in his Cacik (Joghurt). He walked to next flowerbed and showed us his pepermints. We had Pide with Cacik, and it was delicious. Where Students torture their mobile phones. 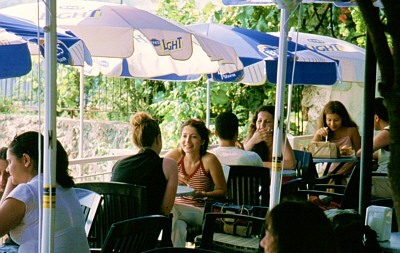 Unbelievable, just a few meters from the high touristic old harbour of Antalya, there is a cafe where local students dominate. It is located just 20 Meters north of the tower "Hıdırlık Kulesi". If you walk the Hıdırlık Sokak above the Harbour to the south, you pass the back entrance. If you miss it, you have to fight your way past two very aggressiv tourist restaurants to the tower. The meals are good. And I got the feeling that the here served Hamburgers are also worth a try. They just looked great. We could sit here for hours. With a plate of water melon (karpuz) or a cold beer and good music, it is very easy to calm down if you just arrived from germany or anywhere else. It's just the best place in town!